Reed Lackey joins the Trektember crew with his review of Season 2, Episode 9: The Measure of a Man. Considered by critical consensus to be the first truly great episode of Star Trek: TNG, “The Measure of a Man” sits directly at the crossroads of civil rights, scientific advancement, the pursuit of justice, and the very qualities of a living soul. The premise involves an ambitious scientist – Captain Maddox – who wants to disassemble Commander Data for the purposes of experimentation and replication. Despite assurances that Data’s memory will remain intact by a downloading process, Data does not feel confident that the ultimate result will be anything other than his own annihilation. 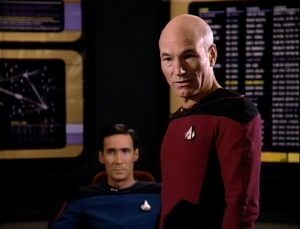 The battle for Data’s right to choose his own destiny begins, with Captain Picard as Data’s defender and Commander Riker being forced by legal stipulations to be his opponent. The episode remains one of my favorites, not only because of my personal affection towards legal dramas, but because of the nuance and complexity with which the subject is explored. Some of the greatest courtroom dramas are nearly equivalent in tension and excitement to any physical combat zone. The blows are verbal and the action is often intellectual, but the battleground is no less intense when the stakes of the conflict are high and the opponents are well matched. In “The Measure of a Man,” Commander Riker’s primary duty is to represent the position that Data is little more than an elaborate and impressive toaster. Riker has been told that if he in any way appears to be underplaying this duty, the entire hearing will be closed down and Data will lose everything. So, he deftly and devastatingly proves that Data is fundamentally a sequence of wires, processors, and (most impactfully) an on-and-off switch. The case appears to be finished. But when Picard returns to Data’s defense, he wisely points out that human beings are merely machinery of a different variety. Instead of micro-processors, cables, and a central motherboard, we have arteries, cells, and a brain. 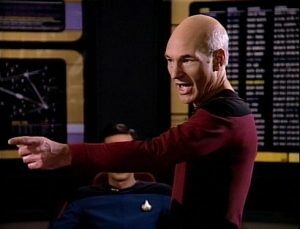 But, as Picard points out, “That is irrelevant.” Because the question on the table is not whether Data is a machine or not, but whether he might be more than merely a machine. The second chapter of Genesis tells us that “the Lord God formed a man from the dust of the ground.” (Genesis 2:7a, NIV) The imagery is of creation, but admittedly a very generalized, encompassing image. There is no detail surrounding the complexity of the human body, the intricacies of neural pathways, or the functions of the individual organs. It simply says a man was formed from dust. Out of raw materials, a thing was crafted. There is, perhaps, a case to be made that the resulting being is a wondrous display of the natural evolutionary process producing a highly impressive and stunningly elaborate machine: a flesh and blood toaster, in other words. Picard argues for Data’s right to choose with two distinct tactics: the definition of sentience and the distinction between property and personhood. Sentience is the capacity for a being to feel, think, and perceive independently and subjectively; if a being possesses that power, there is a common understanding that it should be granted the freedom with which to operate in that power, which is the difference between your possession and your companion. Your toaster has no rights, but your toddler does. The standards which apply to our microwaves, our vehicles, and our refrigerators are not equivalent to the standards with which we should treat our neighbors. If we, as human beings, are merely an elaborate and impressive machine, there is little to defend in the conversation about our rights and responsibilities in the realm of choice. Dysfunctional machines can be dismantled or recycled. Obsolete machines can be discarded, ignored, or stowed away for sentiment. They have no say in the matter. Were we to discuss human beings using comparable language, there would be a deep unrest in our stomachs compelling us to recognize that the standards which apply to our microwaves, our vehicles, and our refrigerators are not equivalent to the standards with which we should treat our neighbors. Perhaps the journey towards loving our neighbor begins with recognizing the divine intention within our neighbor: to see them as more than merely their physical qualities. Perhaps learning to recognize our own beloved condition begins with recognizing that same quality within ourselves. We are tissue, we are bone, and we are blood. But there also rests within us the very breath of life. We are not merely machines. We bear the image of divine intention. We too are the culmination of a dream: a divine imagining which once spoke into darkness and void and said, “Let there be…” In Data’s case, protecting that dream meant not allowing himself to engage in a potentially destructive experiment. But the task which falls to us is more like Picard’s task: to advocate for the divine intention within our neighbor, to show them the love we would show to ourselves. For we too have an advocate. We too have a hope that when we begin to see ourselves as merely machinery or merely raw materials, worth little more than to be cast aside against a weighted scale of metrics and measures, that there is one who stood forward and risked everything to reconcile us with our divine purpose once again. Through Christ, we not only recognize that the divine breath of life swirls within our lungs, but we acknowledge that the same breath is in the face of our neighbors and our enemies. One of Picard’s closing statements in the hearing was simple and inspiring: “Starfleet was founded to seek out new life; well, there it sits! – Waiting.” There we sit, as well. In Christ, the sickness which claimed our very souls has been conquered and the divine purpose has been reignited once again. Once we were dust, once we were material, once we were dead, but now we live. We are not merely constructions. We are not merely fabrications. We are not merely a collection of materials. Thank you for reading Redeeming Culture! Trektember returns tomorrow with the Enterprise’s first taste of the divine in Season 2’s Q Who, so be sure to come back! Reed Lackey is the host of The Fear of God podcast, where he redeems horror films; he can also be heard on the Reel World Theology podcast. I’m glad you chose the quote from Data. It’s such an interesting moment, and one very few other dramas could have even pulled off. Out of context, his words would probably sound like arrogance, but we know his character to be incapable of that, and Brent Spiner’s delivery is perfect to the task of leaving that read off the table. It applies to potentially arrogant humans too, what Data does there. It is a form of false humility to say that you are not something which you are. It *feels* humble, but it isn’t; it’s simply inaccurate. Likewise, describing yourself, or your kind, by referring to the value you actually have is not arrogance. It can feel wrong though, in fact probably does most of the time. That line of Data’s is a good way to exemplify how one can respond to those materialists who suggest that thinking of ourselves as special is speciesist, or a result of human arrogance. Not that we fill up any emotional lack in God (and God would still be love even without us or the world, since God is love in God’s own self), but I love the idea of God dreaming of a creature to be in a unique, real relationship with.